I had the opportunity to review the SunIce Hurricane Byron Gore-Tex Paclite rain jacket and the Tornado rain pants recently. The Hurricane collection brings you the best of the best in golf outerwear. All products featured in the Hurricane category bear the insignia of Gore(r) the leading and most trusted outerwer fabric brand in the world. Growing demand for such innovative and performing products has lead to the expansion of this category. Hurricane now features Gore-Tex(r), PacLite(r), Windstopper(r) and Windstopper(r) soft shell fabrics. Whether facing severe rain or adverse winds, Hurricane has you covered. All Hurricane Gore-Tex Paclite(r) Outerwear shells carry the Gore-Tex(r) guaranteed to keep you Dry(r) promise. The Sunice is a very good looking rain jacket. It is a more tight fitting (European) look, but when you are wearing it, it’s very roomy and comfortable. It is not quite as baggy as most rain jackets. Though, it lacks some of the customization features of the Zero Restriction jacket we reviewed recently. Of course, it is nearly half the price of the Zero Restriction. This jacket is still very comfortable and looks very sharp. The little details on the sleeves are very stylish. This jaket also features removable sleeves from the elbow area. It transforms the complete rain jacket into a wind shirt of sorts. The jacket does a great job of hiding this fact, with some descrete flaps that cover the zippers. This jacket really shines when it comes to performance. I found it very similar in performance to the Zero Restriction jacket. The jacket stays in place throughout the round, the waist and sleeves are nice and secure. With lesser jackets you’ll often find the back or sleeves riding up or moving around during or after your swing. That isn’t the case with this jacket. I played an entire round with this jacket and did not have to adjust it at all. That is pretty remarkable. The sleeves have a plastic like ring around the end that you do not even notice when you have it on, but they keep the sleeves down. When I first saw it, I wondered if it would be comfortable, but when I put the jacket on, you didn’t even realize it was there. This rain channel did an excellent job. The ends of the sleeves also have ann adjustable velcro strap to help tighten up any gaps at your wrist. 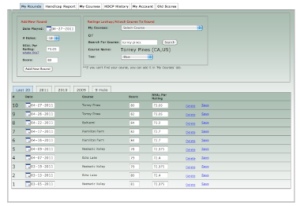 It works very well, and isn’t as difficult to adjust as the Zero Restriction sleeves. The bottom has an adjustable waistband that was easy to adjust to make it fit. The jacket is also a little shorter than most jackets, which is a HUGE plus. I find myself rolling up other rain jackets to make them fit right around my waist. This was totally unnecessary with the Sunice. Since this is a rain jacket, I need to discuss the waterproof aspects of this. It’s amazing. It absolutely poured yesterday in Myrtle Beach, SC, and this jacket kept me perfectly dry. While I wasn’t on the golf course, I was able to walk out from the car to where I wanted to be, and the water just rolled off. I absolutely love the rain jacket. It is nice and light weight, non restrictive, water proof, and won’t completely break the bank. I am not completely ready to put this in the same class as the Zero Restriction Tour-Lite jacket, just because it is a little noisier and slightly more noticable, however, when the warmer weather comes I have a feeling I will be wearing this jacket more often. It is a little more breathable and light weight than the Zero Restriction. If you enjoyed the review of the Zero Restriction jacket, but were put off by the price, check out this Sunice product, I think you’ll be impressed. The Sunice is also a little more stylish than the Zero Restriction jacket. The color schemes, little details, they all work very well. 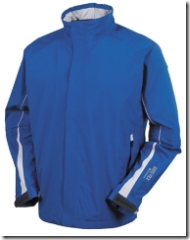 You can find the Sunice Byron Rain Jacket at PGA Tour Stop for $275. However, I am sure you can find some good off-season deals on this jacket at your local pro shop. I have seen them for well under $200. 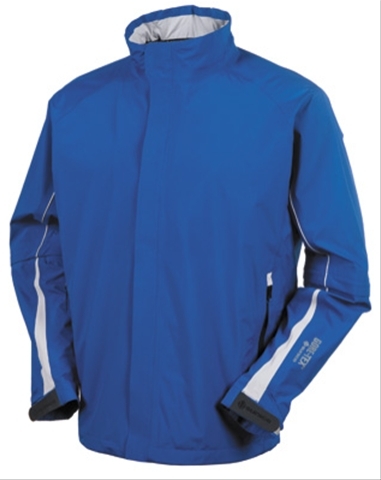 I am looking for new waterproofs and with help from your article decide to purchase the Sunice Bryon jacket in large colour blue ,but unable to find a supplier to buy from any suggestions?